Browse Pulse is the PUP that uses misleading techniques to prevent removal. Use Reimage to locate malicious components and get rid of them faster than with uninstall instructions. A full system scan blocks virus reappearance and prevents traffic to malicious domains. Ads by Browse Pulse is brought to you by SuperWeb LLC. It is an adware that causes problems to computer users since 2015. Once this potentially unwanted program (PUP) gets into the system, it alters targeted browsers’ settings and starts displaying pop-ups, banners, and other types of ads on any website that user visits. 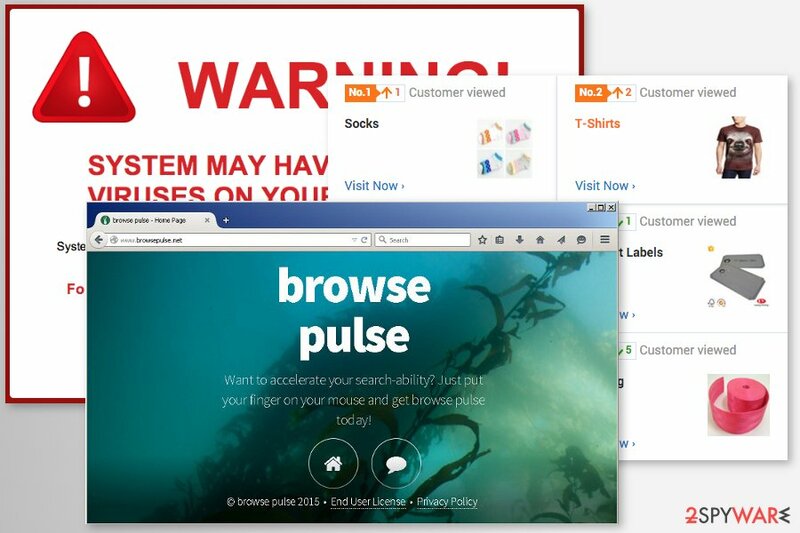 So-called Browse Pulse virus spreads as a browser add-on in freeware and shareware packages. However, users who do not install free programs correctly can let this PUP enter the system without knowing it. Browse Pulse ads usually contain coupons, shopping deals, price comparisons and similar content. However, you should keep in mind that those ads may be filled with links to suspicious third-party websites where you may be tricked into installing another PUP or even malware. Additionally, you should be aware that this adware might pose a risk to your privacy too. Adware might collect various information about users. Usually, it’s non-personally identifiable and browsing-related information such as search queries, clicked ads, recently visited websites, etc. However, no one can ensure that adware doesn’t track or doesn’t allow specific third-party tracking technologies that might try to harvest personally identifiable information. Keep in mind that developers of adware might share or sell aggregated details to affiliates or partners that might be not only advertising networks, but cyber criminals too. 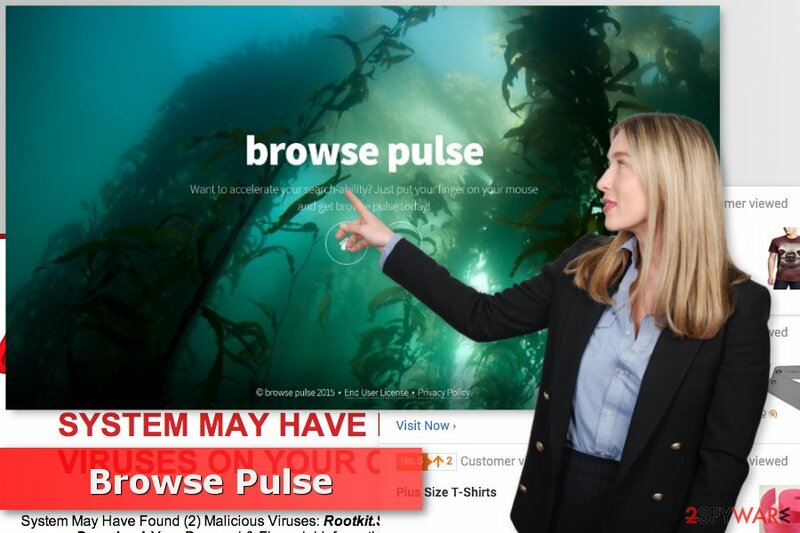 To avoid dangers to your privacy and computer, you should remove Browse Pulse immediately. If you feel skilled enough to get rid of the adware manually, please have a look at our prepared removal guide below. However, security experts from dieviren.de note that users often rush to eliminate adware and overlook its components. As a result, annoying ads and redirects continue disturbing browsing sessions. Therefore, you should avoid failure and opt for automatic Browse Pulse removal with Reimage or another reputable anti-spyware. Browse Pulse is an ad-supported application that might fill the browser with annoying advertisements. Browse Pulse virus is promoted on its official website. However, this website can hardly be found on the Internet accidentally. More frequently this dubious app is downloaded from the Internet without even expecting that. If you want to prevent infiltration of such and similar programs, the most important thing that you have to do is NOT to rush. Always select Advanced or Custom installation option and carefully check everything step-by-step. Your main task is to find “additional components” and unmark ticks claiming that you agree to install them. Be aware that SuperWeb LLC has released a lot of suspicious apps, including Fruit Basket, BrowseStudie, PortalMore and many others. Therefore, you should be careful and avoid installing any of them. Generally speaking, you should opt out of all apps that are spreading around the Internet attached to other programs. We have already mentioned that you can remove Browse Pulse ads either manually or automatically. The first method requires investigating the system and uninstalling programs, browser extensions and similar entries that might be responsible for delivering ads or triggering redirects. Please follow our manual removal guide which is given below. Make sure that you haven’t left any of adware-related components. Otherwise, your browser remains filled with undesired commercial content. However, if you want to avoid the failure and save your time, you should opt for the automatic elimination method. Here, look for Browse Pulse or any other recently installed suspicious programs. Wait until you see Applications folder and look for Browse Pulse or any other suspicious programs on it. Now right click on every of such entries and select Move to Trash. When in the new window, check Delete personal settings and select Reset again to complete Browse Pulse removal. Once these steps are finished, Browse Pulse should be removed from your Microsoft Edge browser. Here, select Browse Pulse and other questionable plugins. Click Remove to delete these entries. Now you will see Reset Firefox to its default state message with Reset Firefox button. Click this button for several times and complete Browse Pulse removal. Here, select Browse Pulse and other malicious plugins and select trash icon to delete these entries. Click Reset to confirm this action and complete Browse Pulse removal. Here, select Extensions and look for Browse Pulse or other suspicious entries. Click on the Uninstall button to get rid each of them. Now you will see a detailed dialog window filled with reset options. All of those options are usually checked, but you can specify which of them you want to reset. Click the Reset button to complete Browse Pulse removal process. ^ Tim Fisher. What Is Shareware?. Lifewire. Tech how-to guides and tutorials. ^ Dieviren. Dieviren. German spyware and cyber security news. This entry was posted on 2018-03-11 at 05:46 and is filed under Adware, Viruses. You can quickly scan the QR code with your mobile device and have Ads by Browse Pulse manual removal instructions right in your pocket. How did you remove Browse Pulse ads?